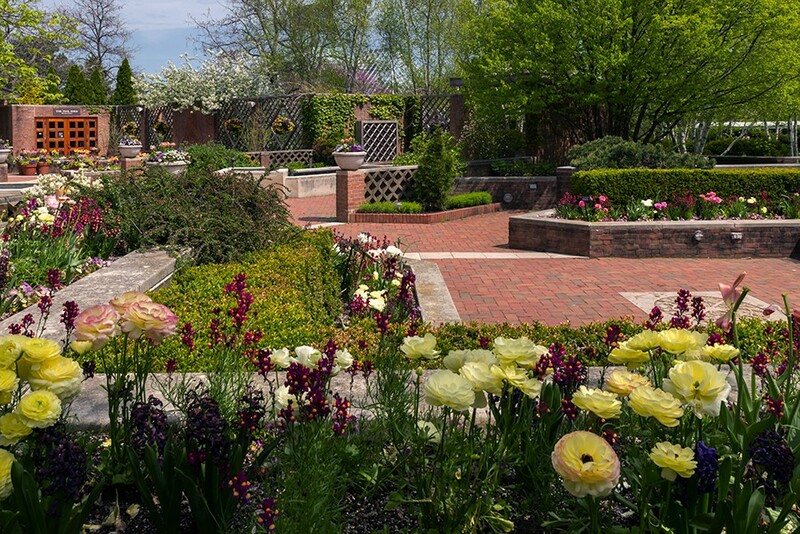 At first glance the Buehler Enabling Garden just looks like another plot in the Chicago Botanic Garden, with brick-paved walkways, hanging planters, and raised beds filled with flowers. A closer look, though, reveals that the paths are flat and wide to accommodate people in wheelchairs, the hanging baskets are on pulleys that allow their heights to be adjusted, and the flowerbeds are at various elevations so that gardeners can work on them from a seated or standing position. A section of lawn is raised so that people who have difficulty getting up from the ground can sit on the grass, and in another area a garden is planted in a metal grid, allowing visually impaired people to count the squares and identify which plants they’re working with. In fact, she says, technically what her department does is considered therapeutic horticulture. “If you’re doing horticultural therapy, you’d be working with professionals, charting progress [of patients]. We are not privy to people’s charts or medical information. We’re supplementing their care but we’re not part of the treatment plan.” Her department does, however, have off-site programs at Shriners Hospital for Children and the Edward Hines Jr. VA Hospital, along with some assisted living facilities, where Botanic Garden staff members work with patients to build and maintain gardens, often using herbs, flowers, and other plants chosen because they stimulate the senses. The Chicago Botanic Garden has one of the oldest and most comprehensive programs in the U.S.—the Buehler Enabling Garden opened in 1999, and the garden’s horticultural therapy program and first Enabling Garden launched 22 years before that. The garden now offers a horticultural therapy certificate program through the adult education department and in conjunction with Oakton Community College, where the participants get college credit. The 12-credit class is mostly online, Green says, but the students come to the Botanic Garden for a week of intensive programming and visit other therapeutic gardens in the area. There aren’t many, though. Green says that Rush University Medical Center is putting in a healing garden, and Growing Solutions Farm in the Illinois Medical District teaches urban agriculture to young adults with autism, but she doesn’t know of much else.